Imagine if you could manage all your fan marketing activities through a single platform that integrated Text, Email, your Website, Fan Database, Store and More in a simple, easy to use Portal. Introducing the Adva Mobile 2019 R1 Enhancements. What can you do with the All-New Adva Mobile platform? We’ve added new choices for your WEB Apps that are more modern and more exciting. You can choose among the new designs above, and there are more design choices on the HOME – THEMES tab on the Portal. In R1 we have a new design with different color schemes. In the future we’ll add new layouts with different color schemes, so you’ll have more choices. If you have a design template you like, let us know and we’ll get it in the queue. Everyone on the Adva Mobile Platform needs to check out your HOME PAGE Image on your Web App. When we were offering only Mobile Web Apps, small, low resolution images looked just fine, however some of these images don’t look great on Desktop, with our new Responsive Web Apps, so you should change your HOME PAGE IMAGE (on the HOME – BASIC tab) and upload an image with high resolution, low bit rate (so it loads quickly) but high pixel count: 600-800 pixel wide image would look OK.
One of the terrific new features is the flexible option to direct fans that text in to your Web App to be directed away from your Adva Mobile Web App and to any URL/Web Page you choose. In the past, this was permanently hard coded. Now, Artists can move between their own URLs and Adva Mobile created Web Pages based on the marketing campaign they want to establish. Artists can have fans land on a Smart URL for a new song being released, an Adva Mobile Contest Page when a Contest is running, and a YouTube or iTunes URL when you’re promoting a new video to watch or music to buy. Really Flexible! Of course, when you redirect fans OFF the Adva Mobile pages, we can’t collect Fan engagement data and score them and help you know who your True Fans are. Sometimes that’s OK though. A. Normally, fans that get to your new responsive web app (either going there from a URL Link, or texting in to your Keyword) go to you HOME PAGE. B. You’ve created a new Spotify pre-save campaign, or exclusive YouTube Video Premier. So you REDIRECT your web app to the Spotify or YouTube Link. C. Now, you filter your Fan Database to identify SuperFans … fans with an ENGAGEMENT SCORE over 10, for Example. And you send out a text blast to this Filter = SuperFans, because the early look is exclusive to them. D. In a few days, you can resent the link back to your Adva Mobile Web App HOME Page. Or, keep the REDIRECT up and send a text blast to all your Fans. Check it out! Being able to mix and match your text and email marketing that drive fans to various web pages to engage them – Adva Mobile Landing Pages, your Website Pages, or third party pages like iTunes, Spotify, or Instagram, offers unlimited flexibility for how you want to use Text and Email Marketing to engage your Fans. We’ve expanded the way you can SEGMENT your Fans on our service to provide the most optimized, personalized engagement with your Fans. In addition to being able to segment fans by the FIELD of the Fan Profile, you can create your own Tags, associate individual Fans to a Tag, and then filter Fans on the Tag you created. In the above screen capture, there are a series of Tags we created on our test site …. Street Team tags, for example, for Texts or emails specifically targeted to that group of users. Take advantage of this dynamic capability to segment Fans by concert, date joined, purchases … really anything you want to identify to help engage your fans personally. We’re on a new hosting platform and you – and your Fans – should see faster performance when you’re on your Web App or the Adva Mobile Portal. Fast performance is critical to a positive user experience and we know this new hosting platform will meet your expectations for a profession digital marketing service. Want to learn more? 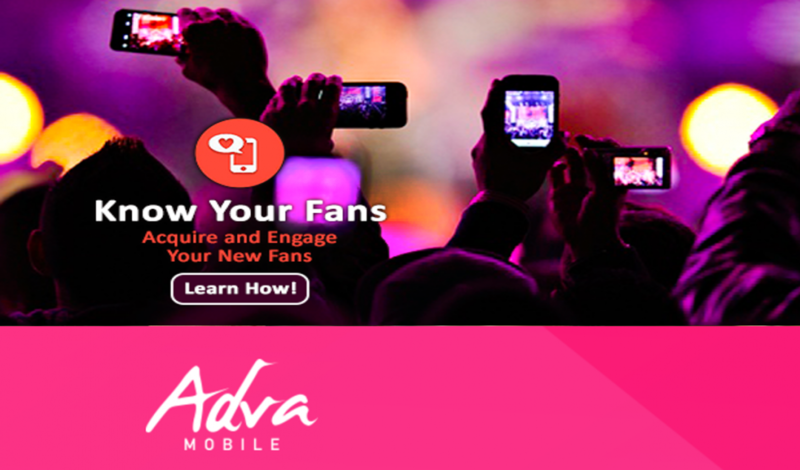 Log in to the new Adva Mobile R1 Platform now and check out all the ways you can use Text, Email, your Website, Fan Database, Store and More to acquire new fans, engage them on mobile (and now all) devices, identify your SuperFans and sell to them. It’s your creative career – Take charge with Adva Mobile. We’re with you.